We are starting a ten day summer vacation and, like millions ofnpther families, we’re spend the first day in the plane. My daughter, age eight, is happy though. She has four books and is just discovering Lemoney Snicket. She’s been asking for a Nintendp DS, but we are holding fast against that. I did give in, finally to Wii, but only because we can play that as a family. The only activity I want her doing that envelops her in her own private world is reading, at this age. 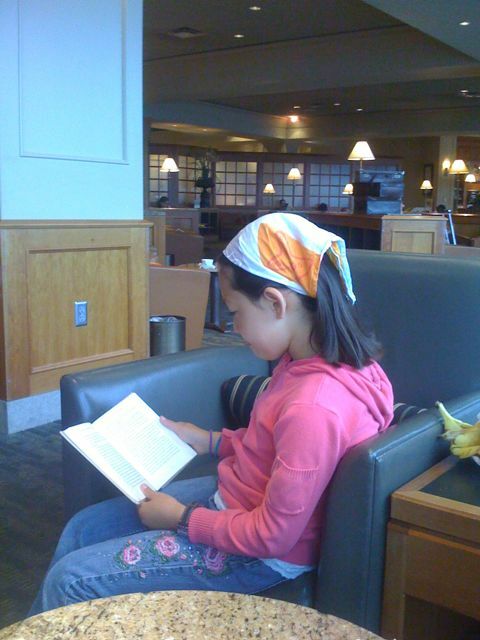 Even now, reading for her is a communal activity. She stops every few pages to read me a particularly funny sentence.